The system allows export of all contacts or a filtered set of contacts based on audience rules into a CSV file. Choose to export all contacts or build a specific audience using audience rules. Learn more about creating an audience. 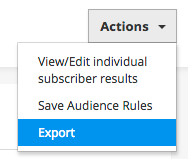 To export the audience, click the Export button or choose Export from the actions menu. Fill out the appropriate fields. Export Name - The name may only contain letters, numbers, and dashes. Choose Attribute Columns - Select which attributes you would like included in the export. Note that channels.email.address is referred to as email in the dropdown. Note: In order to export all attributes and all lists you must explicitly select them. Choose List Columns - Select which list association you would like included in the export. Header - Select whether or not to include a header row in the export. Compress - Select whether or not to compress the export file. If selected, the file is compressed using GZIP with the file extension ".gz" added to the filename. Destination - Choose whether to download the file locally, send it to FPT/SFTP, Amazon S3 or Google Cloud storage. Schedule - Choose whether to export immediately or on a recurring schedule. After exporting you will be taken the Jobs page where you can download the export. You have the option of exporting contacts on a recurring schedule. 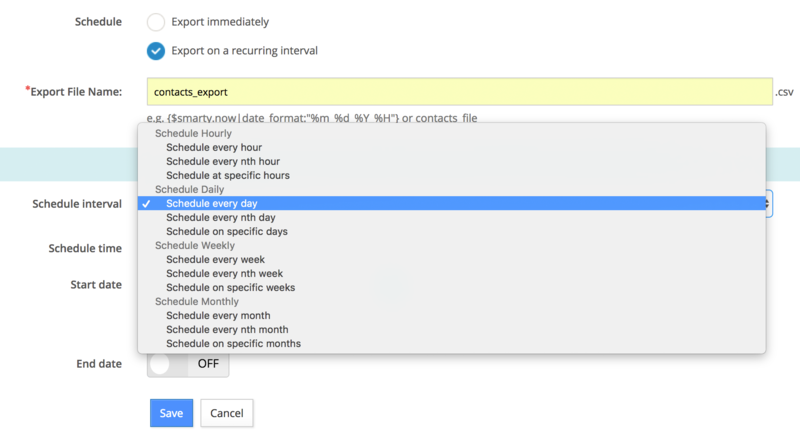 For Schedule, choose Export on a recurring interval. Input a name for the Export File Name field. The Export File Name field supports Smarty so you are able to use Smarty variables in the URL path. For example, you can use Smarty to render the current date at the time of export using either the smarty.now function (set to UTC time) or the Smarty utility getNow (gives ability to set the timezone). Learn more about date and timestamp variables. Set Schedule Interval for the desired interval. Select the Start Date and optional End Date and click Save. The End Date is the last day that the export will run. If Start Date and End Date are both in the past, the export will not run. After clicking Save, you will be taken to the Data Automations page where you can view, disable/enable or remove a scheduled export. If Send File to FTP was selected during configuration, the exported file will be available on the designated FTP site once the export job is completed. If the Send file to FTP option was unchecked, the file download will be available on the Jobs page once completed. You also have the option to export contacts via the API. To learn more, read the article on exporting contacts via the API. In the next article learn how to delete contacts.